The “beautiful game” is here, and for many, the matches will be broadcast early in the morning. But, soccer fans are a very special breed: many will wake up, put on their jerseys and prepare their game face to cheer on their team. These die-hard fans deserve a strong cup of coffee to keep them going and Toyota’s Tundra Power will come to the rescue. Over the next four weeks, Toyota will reward these early rising, hard-working fans with an extra jolt of energy through a great cup of joe. Toyota traveled to the coffee region of Veracruz, Mexico, with a top coffee producer to bring one of their strongest blends that embodies the spirit of Tundra. In collaboration with World Foods & Flavor—U.S. importers and distributors of coffee— Toyota chose one of their special blends made with 100% Mexican Robusta and Arabica coffee beans, creating an intense roast inspired by Tundra’s relentless spirit. 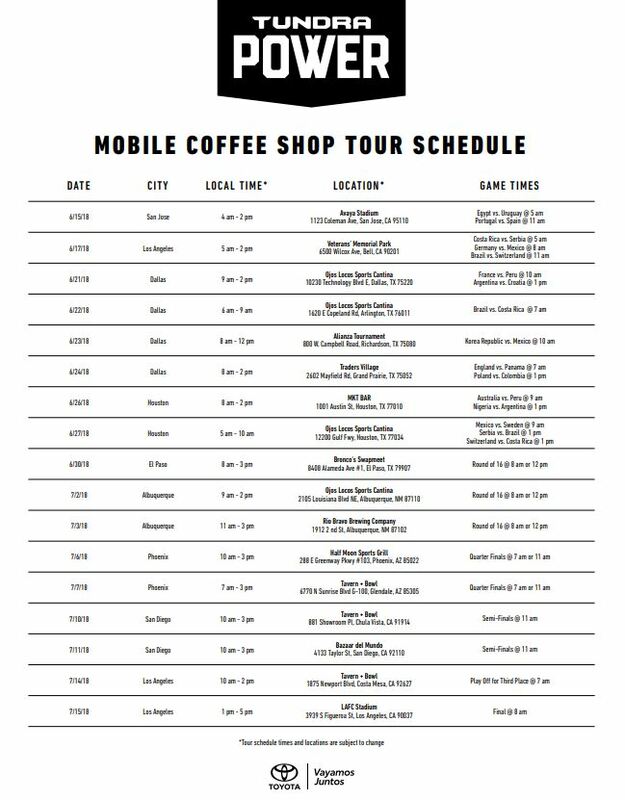 Fans in select markets will have an opportunity to sample the coffee at a Tundra Power Mobile Coffee Shop stationed near special viewing parties and venues. Toyota Latino social media channels will amplify the promotion, where hard-working fans can use #TundraPower and #Ad to obtain their own coffee at home (while supplies last). Take a sip and experience Tundra Power . . . And may the best team win! About Toyota: We’re in the business of making great cars and trucks. But we also work every day to apply and share our know-how in ways that benefit people, the community and our planet in order to build a better tomorrow. We’ve been a part of life in America for over 50 years. And while we’re passionate about making great cars and trucks, our story is about much more than our vehicles.